To alleviate the monotony of practices, every drill is a competition and all results are recorded. The coaching staff tracks the competitions throughout the season to determine playing time and the on-court rotation. From the players’ point of view, winning a friendly competition is one of many ways to earn a star on the Reward Board. 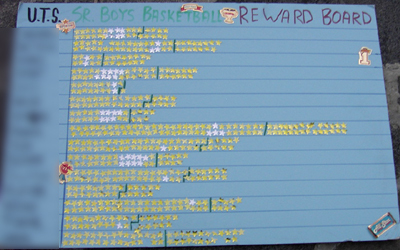 A board used to motivated gifted student-athletes at the University of Toronto Schools for their effort and accomplishments in practices, during games and at school. a combination of talent and effort so that all players are included. Basketball coaches receive many items that can be used as prizes. Golf shirts, watches, T-shirts, gift certificates (large and small), game tickets, and other prizes can be distributed to the leaders. Usually, the team will determine how to allocate the prizes. The goal of the board is friendly competition and pushing each other, not rivalries and exclusion. The monetary value is largely irrelevant, as is the age of the players involved. Winning (and getting recognition) appeals to everyone. At the University of Toronto, postsecondary aged student-athletes were going all out to win ten dollar T-shirts. Note: It is unusual that a player will win the contest by the margin illustrated in the above photo. This reflects an exceptionally consistent effort. Normally, the results are closer and most players are in the running for first place until the end of the year.